By now, we're accustomed to seeing gymnastics prodigy Simone Biles on the Olympic medal podium, but not with bronze. That's what we saw on Aug. 15, when an error on balance beam landed her in the third-place spot in the event. It was disappointing for Biles, who had won three golds for vault, team all-around, and individual all-around by the time she mounted the beam. But her consolation was seeing her teammate and longtime friend receive the silver medal next to her. Biles is proud of Laurie Hernandez, who placed second in the event, earning her first medal for an individual event at the 2016 Olympics. Hernandez approached the beam full of nerves. She told TODAY, "I kind of thought I was going to throw up before I went." Despite the jitters, Hernandez delivered an incredibly strong performance, bested only by Dutch gymnast Sanne Wevers, who took gold. Hernandez is plenty happy with her silver medal. "I've been training so hard so I'm glad I just did the routine I've been doing in practice and I have no regrets," she told TODAY. 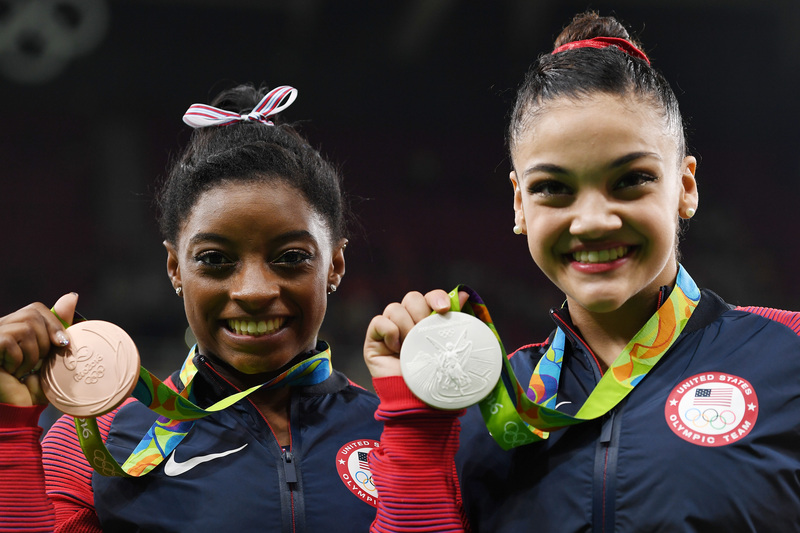 Even though Biles was disappointed about her beam error, she was thrilled with 16-year-old Hernandez's performance. "I couldn't be more proud of Laurie for how she is performing tonight and how she has carried herself this whole Olympic experience," she told Today, noting that one could hardly believe it's Hernandez's first time at the Olympics (both gymnasts were too young to compete in the 2012 Games). For Biles, a personal disappointment doesn't overshadow happiness at others' successes. Monday morning before the beam competition, Biles posted a throwback photo of herself and Hernandez hanging out together when they were younger on Instagram. The caption read, "Funny thing is back then we never thought we would be competing at the Olympics. Crazy how things happen, so excited to be competing in Beam Finals today with this girl...love you so much!" She ended with a solid message to the public: "DREAM BIG GIRLIES." Hernandez likely has a very bright gymnastics career ahead of her. Her routines have a signature flair to them, earning her the title of "human emoji" from International Gymnast Magazine and "baby Shakira" from the podcast GymCastic. The beam competition was her opportunity to shine in Rio, and she did. We can expect to see a lot more medals around Hernandez's neck in the years to come, with her girl Biles right there by her side.